The following review appeared in the Arts and Culture section of The Greek American, November 18, 2000. Tenor Marko Lampas and his wife, soprano Barbara Iona Miller, sang leading roles in Genesis Opera's opening night of "A Celebration of Puccini: Il Tabarro and Suor Angelica," in New York, November 10. In "Il Tabarro," Lampas plays the lover of the married Giorgetta, played by Miller. A tall, attractive couple, Lampas and Miller make the lovers' interest in each other plausible. Lampas' strong personality creates an imposing stage presence that pairs effectively with Barbara Iona Miller's beautiful stage persona. Miller excels in the dramatic moments of the opera. Among the other excellent performances in both "Il Tabarro" and the "Suor Angelica," Lenna Darbin successfully brings humor and lightness to the role of Frugola in "Il Tabarro." Born in Greece, Lampas won scholarships from the Metropolitan Opera and the Juilliard School and to the master classes of Maria Callas. Singing with Callas, he says was "one of the most wonderful experiences of my life," the moments he spent singing "A te o Cara" with her are an unforgettable treasure. Barbara Iona Miller is a graduate of the Juilliard School and has performed the major Puccini and Verdi heroines. 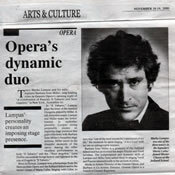 The temperament and dramatic skills of Lampas and Miller have suited them to singing Verdi and Puccini internationally to the acclaim of critics. Marko is artistic director of the Genesis Opera, and Barbara is co-artistic director. Genesis Opera is a branch of Genesis Repertory. “Miss Miller is an exceptionally attractive Violetta physically as well as in her acting. She sang with great control but with tenderness and passion. Her “Sempre libera” in Act I was especially dazzling. “Addio del passato” in Act IV was sung with beautiful delicacy and loveliness. Madison Eagle, N.J. Soprano Barbara Iona Miller gave a finely crafted performance portraying a Violetta of both porcelain delicacy and considerable strength and power as the role demanded. And she has the acting ability to back up her vocal powers.” Denville Citizen, N.J.
“Barbara Iona Miller was a bombshell of a Musetta, and sang a waltz song that lit up the stage. She overpowered the second act with her deliciously wicked vamp of a Musetta.” Daily Record, N.J.
“Barbara Iona Miller is suitably shrewish as both Kate and Lilly Vanessi in this Kiss Me Kate, but beautiful as either. She manages the tender parts of her role better than any actress this season. Her “I Hate Men” is wonderful and wonderfully punctuated.” Greenville Daily Reflector, N.C.
“Marko Lampas cut a fine figure on stage, and by the end of Act III with the aria “Ah si ben mio” and “Di quella pira,” he had the audience in the palm of his hand.” Star Ledger, N.J.
“An excellent production . . . Marko Lampas’s Radames gave the audience a chance to hear the best operatic voice to appear in the area.” Denville Citizen, N.J.
“Marko Lampas as Rodolfo quickly won the audience with the aria “Che gelida manina.” He has a strong stage presence and a rich voice of considerable emotional range.” Star Ledger, N.J. Copyright © 2002-2019, Marko Lampas.